Line 16 muffin tins with paper liners and set aside. In a large bowl, whisk together melted butter and cocoa powder until the mixture is smooth and thick like fudge sauce. Stir in sugar until combine. Add eggs and vanilla, stirring until combined. Stir in flour until no streaks remain in batter. Fill muffin tins 2/3 full and bake for about 15 minutes or until center of brownie cupcakes spring back when lightly touched. While cupcakes are baking, cut marshmallows in half horizontally. Place one marshmallow, cut side down, on each cupcake. Pop back in the oven for a minute or two, until marshmallows are puffy. Remove from oven and top with a third of a chocolate bar and a graham cracker half. 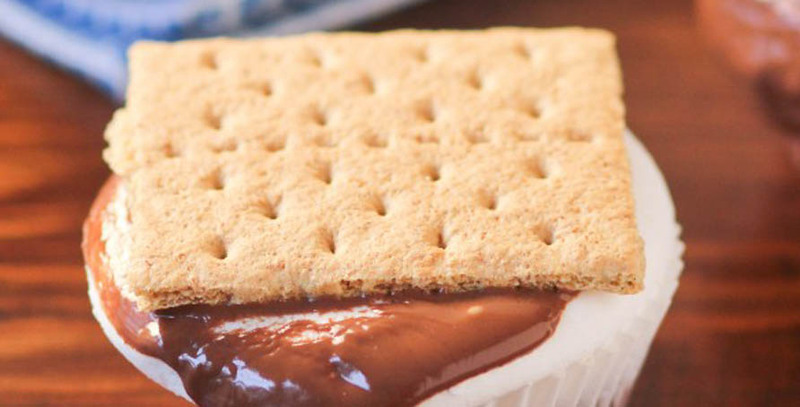 Serve within an hour of topping with marshmallows and chocolate — when the marshmallow hardens back up it makes it hard to remove the cupcake wrapper. Desserts don’t get much better than this — even the kiddos can help with this one!